Austinite: Mineral information, data and localities. Colorless to pale yellowish white or bright green; colourless in transmitted light. 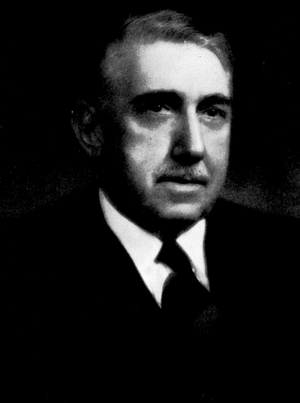 Named by Lloyd Williams Staples in 1935 in honor of Austin Flint Rogers (August 16, 1877 Lathrop, Missouri, USA -March 10, 1957 Berkeley, California, USA), American mineralogist at Stanford University. Adelite-Descloizite Group. 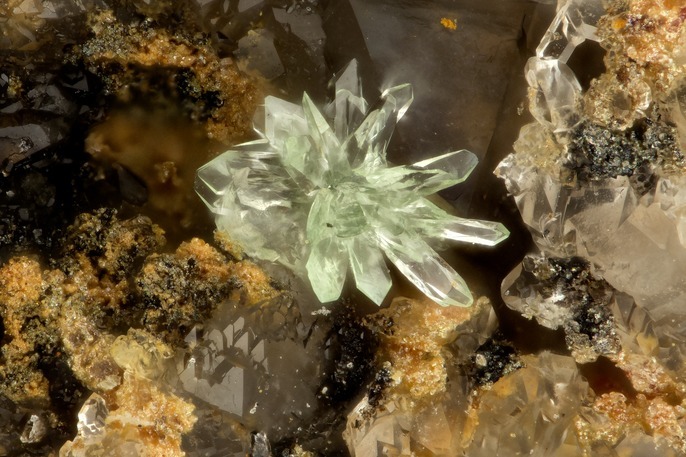 Austinite-Conichalcite Series. 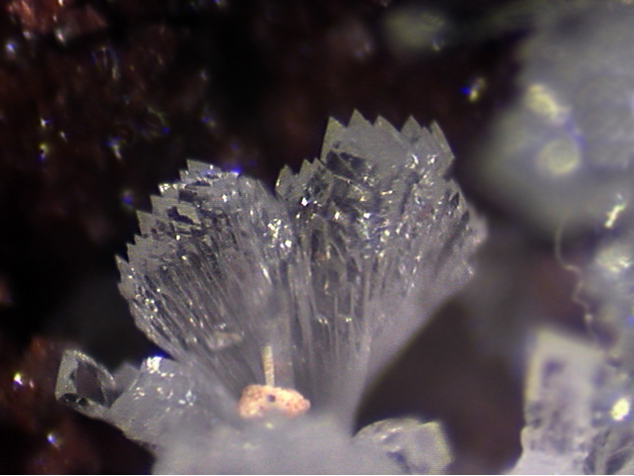 The zinc analogue of Cobaltaustinite and Nickelaustinite. Enantiomorphous bladed crystals elongated , radial fibrous crusts and nodules. Left and right hand individuals joined on (100) with (010) and (001) coincident. Oxidized zone of metal deposit. Cuprian Austinite A cuprian variety of Austinite. Originally reported from Guchab prospect, Guchab-Rodgerberg area, Grootfontein District, Otjozondjupa Region, Namibia. Adamite 30 photos of Austinite associated with Adamite on mindat.org. Talmessite 18 photos of Austinite associated with Talmessite on mindat.org. Cuprian Adamite 13 photos of Austinite associated with Cuprian Adamite on mindat.org. Conichalcite 7 photos of Austinite associated with Conichalcite on mindat.org. Hedyphane 6 photos of Austinite associated with Hedyphane on mindat.org. Willemite 4 photos of Austinite associated with Willemite on mindat.org. Limonite 4 photos of Austinite associated with Limonite on mindat.org. Calcite 3 photos of Austinite associated with Calcite on mindat.org. Smithsonite 3 photos of Austinite associated with Smithsonite on mindat.org. Baryte 3 photos of Austinite associated with Baryte on mindat.org. Staples, L. W. (1935): Austinite, a new arsenate mineral, from Gold Hill, Utah. American Mineralogist: 20: 112-119. Ahlfeld and Mosebach (1936) Zentralblatt Mineralien: 226, 287 (as Brickerit). Brendler (1938) American Mineralogist: 23: 347. Richmond (1940) American Mineralogist: 25: 441. Palache, C., Berman, H., & Frondel, C. (1951), The System of Mineralogy of James Dwight Dana and Edward Salisbury Dana, Yale University 1837-1892, Volume II. John Wiley and Sons, Inc., New York, 7th edition, revised and enlarged, 1124 pp. : 809-810. Neues Jahrbuch für Mineralogie, Monatshefte (1988): 159-166. Anthony, J.W., Bideaux, R.A., Bladh, K.W., and Nichols, M.C. (2000) Handbook of Mineralogy, Volume IV. Arsenates, Phosphates, Vanadates. Mineral Data Publishing, Tucson, AZ, 680pp. : 43. The following Austinite specimens are currently listed for sale on minfind.com. Personal collection of M. Willoughby. EDAX and SEM confirmed. Kolitsch, U., Auer, C. & Zeug, M. (2017): 2046) Austinit, Billingsleyit, Konichalcit, Lenait?, Luzonit, Marrit, Trechmannit und Zinkrosasit von Annaberg, Niederösterreich (ein Vorbericht). Pp. 265-268 in Walter, F. et al. (2017): Neue Mineralfunde aus Österreich LXVI. Carinthia II, 207./127., 217-284. Ahlfeld and Mosebach (1936) Zentralblatt Mineralien: 226, 287 (Brickerit); Palache, C., Berman, H., & Frondel, C. (1951), The System of Mineralogy of James Dwight Dana and Edward Salisbury Dana, Yale University 1837-1892, Volume II: 810. Berbain, C., Favreau, G. & Aymar, J. (2005): Mines et Minéraux des Pyrénées-Orientales et des Corbières. Association Française de Microminéralogie Ed., 53-59. Berbain, C. & Favreau, G. (2010): Austinite plombifère de Can Pei, Montferrer (Pyrénées-Orientales), Le Cahier des Micromonteurs, 108(2), 31. Katerinopoulos, A. (1996): Bisher nicht bekannte Minerale aus den Lavrion-Bergwerken. Lapis, 21 (11), 39; 62. Fernando de ls Heras y Maraver (1956). Estudio- informe, yacimientos de wolfram "Cogolla Alta" y "Triunfo a San Rafael" sitas en término de Belalcázar(Córdoba). Miguel Calvo Rebollar (2015). Minerales y Minas de España. Volumen VII. Page 94. Keith, S.B. (1972), Mineralogy and paragenesis of the 79 mine lead-zinc-copper deposit, Min.Rec. : 3: 247-264.
ⓘ San Rafael Mine ? Dunn, P.J., Mineralogical Record: 10: 160-165; Dunn, Pete J. (1995): Franklin and Sterling Hill New Jersey: the world’s most magnificent mineral deposits, part: 5: 658. Collected by and analyzed by Chris Carlson. Palache, C., Berman, H., & Frondel, C. (1951), The System of Mineralogy of James Dwight Dana and Edward Salisbury Dana, Yale University 1837-1892, Volume II: 810; American Mineralogist (1971): 56: 1359. Kokinos, M. and Wise, W.S. (1993), Famous Mineral Localities: the Gold Hill mine, Tooele County, Utah. 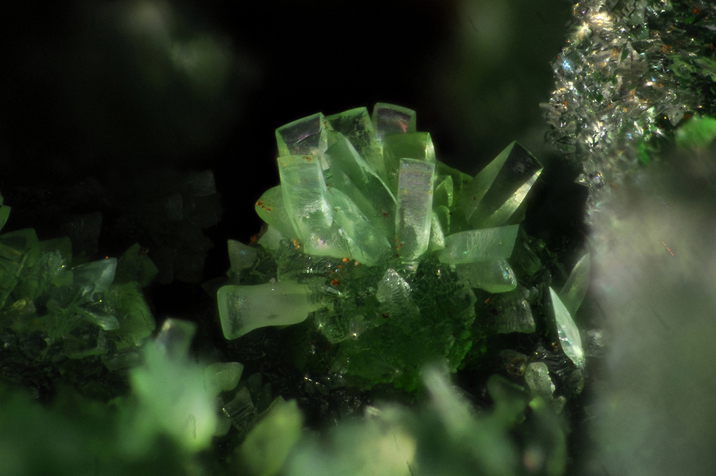 Mineralogical Record: 24(1): 11-22.